How to smuggle a queen bee across state lines. What to do with a hive that's gonna explode. Why the bees are hanging out in front all the time. Then in these slideshows, see how Marty Hardison combines two weak colonies and then splits a booming one. Click anywhere in the black area surrounding the pictures to go off-site to the Picasa Web Albums, where you can see full-size images and read the captions at your leisure. 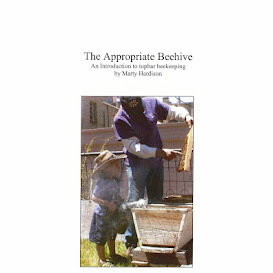 Last but not least, also posted on SoundCloud, there is another audio recording that contains Pearls of Wisdom for Colorado Beekeepers. Have a listen – you'll get a sneak preview of next month's Top-Bar Hive Beekeepers meeting at the DeLaney Community Farm.